A friend writes: “The 8th of March was International Women’s Day. All day my inbox flooded with emails acknowledging the brave women who have campaigned over the years for equality and justice. Then the following day, I received a beautiful tribute to an amazing young woman who had also been part of this struggle. I met Catalina in 2005 when she was 17 years old. She was a student, studying community development at the school run by Asociación Ak’Tenamit, a school for mayan youths in the Rio Dulce area of Guatemala. She was an outspoken and impressive young woman, a born leader with a warm smile. Every day I would travel to school by speedboat with the female students. We would chat, sing, and share experiences. She was always there, always part of some of the most genuinely beautiful moments I have experienced. Catalina was murdered last month, aged 23. She was on her way back to her community after finishing her day’s studies at university. You can see below the urgent action that Amnesty International have issued. Catalina and her friends had taken part in negotiations on a land dispute in the area. There is concern that other members of her community are now at risk, having also received death threats. Please take the time to write appeals before the 5th of April. They could save the lives of more people like Catalina. 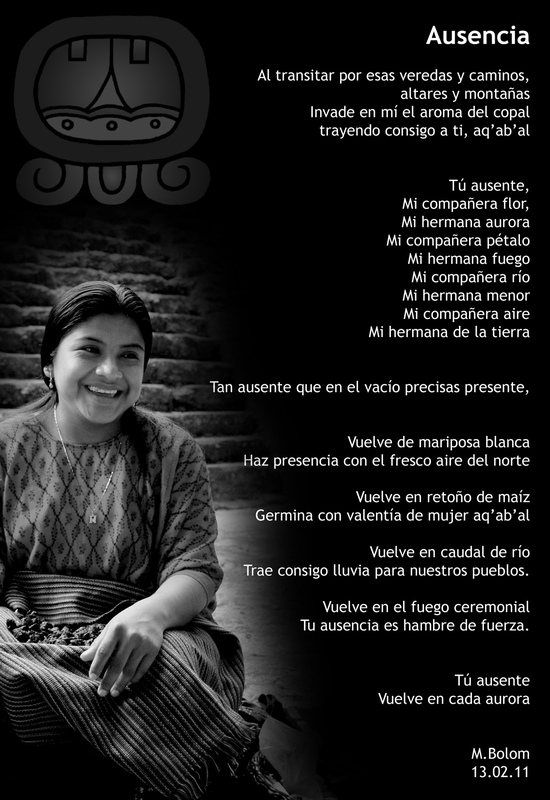 This entry was posted in Life and tagged amnesty international, Guatemala, human rights, human rights violation, indigenous rights, land rights, Latin America, literature, Maya, poetry, q'eqchi', translation. Bookmark the permalink.